In my previous post (Part I), I explained how to do Database first in .Net Core 2.0 and we created Employee Web API by Database first approach. You can find all of my .NET Core posts here and the source code of my sample application here. 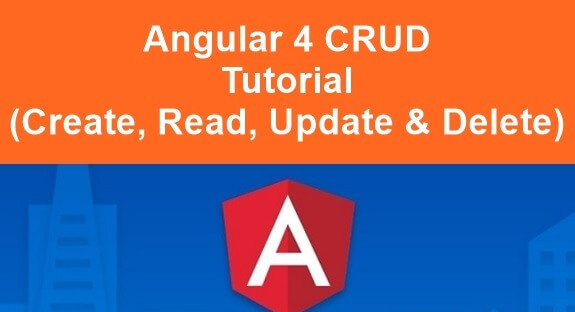 This post is Part Two of the articles on Angular 4 + Core 2.0 CRUD operations. In my previous post (Part I), I explained how to do Database first in .NET Core 2.0 and we created Employee Web API using Database First approach. This, you can find here. 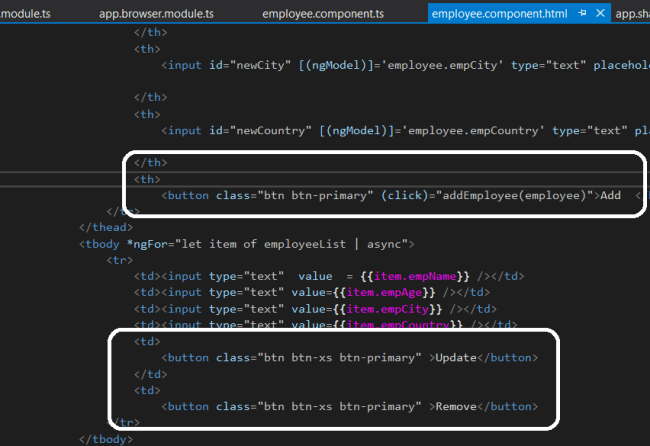 In this post, we will add different Angular component classes to perform the CRUD operation using an API that we created in this post and will show the details on UI as shown below. Add Employee folder on the ClientApp folder, as shown below. Let us first add the code to get all employees and later, we will add the code for Add, Update, Delete. For this, we will follow these steps. As you can see in the above code, we are getting all the employees by calling /api/GetAllEmployees. Add the below HTML code to the file. Add the below code in the component class. // if you want to debug info just uncomment the console.log lines. As you can see in the above code, we have specified that the application should call GetAll method of the service on init. 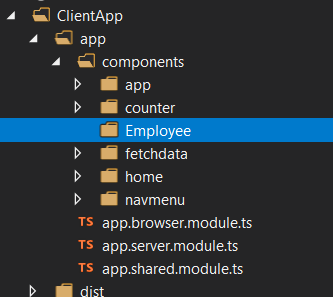 Add EmployeeComponent to the class app.shared.module.ts, as shown below. Update Navigation menu and add the Employee link as below. Run the application and click on Employee Management. As you can see, all the data in the database, is displayed here. You can find the source code of my sample application here. You can find all of my .NET Core posts here.